FUTURE FLASH 200 is the theme of the 5th edition of TEC ART. From 7-11 febr, during the Art Rotterdam Week, TEC ART looks into the future, presenting 4 long days and nights. With expo’s, symposium, talks, tec-music, experiments and parties at the cutting edge of art and technology. The festival takes place at three locations: WORM, V2_Insititute for Unstable Media and public space around the Boomgaardsstraat. The spaces of WORM and V2 form an interactive antropocene playground and are connected with a corridor during TEC ART. Both spaces are filled with installations, robotics, Artifical Intelligence en virtual realities. Experience the works of Floris Kaayk, Frederik de Wilde, Maartje Dijkstra, Angelo Vermeulen, Daniela de Paulis, Joris Strijbos + Daan Johan and others. More over, there are showcases of 25 talented ‘born digitals’, 2017 graduates from the leading Dutch art academies in the field of creative technology. During the previous edition a 7m replica of the moon was hanging in the Boomgaardsstraat. This edition the public space will be extended. After sunset the street will be transformed into a freely accessible futuristic twilight zone. Saygin Soher uses videomapping technology with 3D effects on 200m2 of architecture. 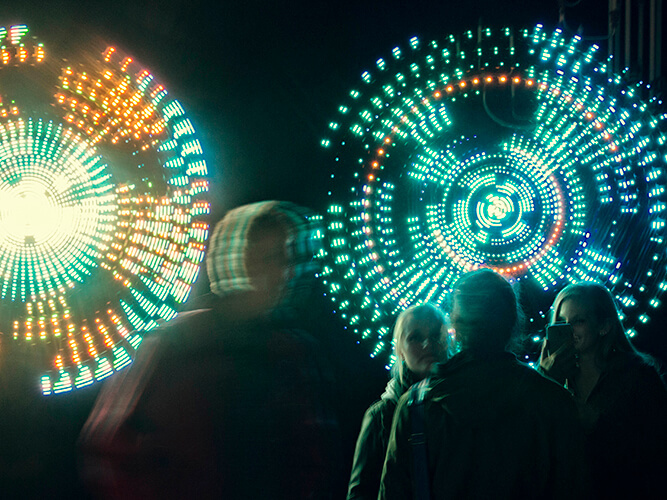 Visitors are also able to enter and traverse a 100m long audio-visual doppler effect by Michel Suk, who is well known from his spectacular installations at GLOW Eindhoven. Together with filosophy professor René ten Bos, TEC ART 2018 explores the future. The theme of FUTURE FLASH 200 gives room to go back into time to the year 1818, when Mary Shelly wrote her novel Frankenstein; about the iconic birth of the very first cyborg, the prototype of human enhancement. But with FUTURE FLASH 200 we mostly look towards and beyond the future. How do humans and art relate to each other in these days of exponentially growth and rapid developments in technology, while becoming more and more part of the digital networks, artificial intelligences and steering algorithms that run modern society? What does this imply for the future of contemporary art and mankind? TEC ART presents an extensive parallell-program, consisting of with blasting Machine Music Techno Night, special artist and panel talks. And Saturday the 10th of February we have reserved one excusive afternoon for space artist Daniela de Paulis and her neuro engineers. That afternoon, as part of the installation COGITO, visitors can scan their brain and send it into space through the Dwingeloo Radiotelescope.